BACKGROUND: Bite wounds, from human and animal origin, can lead to significant complications if appropriate therapy is not undertaken timeously. A basic knowledge of the microbiological flora is essential for each clinical setting in order to be able to facilitate appropriate empiric antibiotic therapy. MATERIAL AND METHODS: All patients admitted to the Steve Biko Academic Hospital over a 27-month period with histories of bite wound and taken to theatre for debridement were included in this study. All culture data was collected together with sensitivity profiles for all organisms isolated. RESULTS: In total, 38 patients were included in this study, with 25 sustaining human bite wounds, 11 sustaining dog bites, and only two with snake bites. The most striking finding is the predominance of Streptococcus spp isolated from human bite wounds. Although a relatively rare finding, Salmonella spp was isolated from one of the patients who sustained a snake bite. A surprising fraction of isolates were resistant to Amox-Clav, with only marginally improved sensitivity rates to second generation cephalosporins and fluoroquinolones. CONCLUSIONS: This study emphasises the importance of obtaining microbiological cultures on all patients admitted with bite wounds. This will not only assist in surveillance practices, but also provides the clinician with targeted therapy if the empiric antimicrobial should fail. The clinical significance of bite wounds extends beyond the local complications as various systemic complications have also been ascribed to this type of injury. This includes systemic sepsis by Pasteurella multocida,11 Capnocytophaga canimorsuS6 or Salmonellosis,12 rat-bite fever13 and rabies,14 to name but a few. The aim of this study is to describe local epidemiology with regard to the types of bite injuries presenting to Casualty, the associated microbiological causes of infection and the appropriate antimicrobial therapy indicated. All patients admitted to the Steve Biko Academic Hospital between January 2009 and March 2012 (27 months), with a history of human or animal bite wounds, and taken to theatre for debridement, were included in this study. Clinical data collected included the type of bite wound sustained, as well as patient demographics. All microbiological cultures performed were either on swab or tissue samples collected from all patients. The current practice at the Steve Biko Academic Hospital is to obtain multiple swab and/or tissue samples from a single patient during the initial debridement. This is irrespective of the number of bite wounds sustained. The aim is to produce a representative sample to the microbiology laboratory in order to optimise growth yield. These samples were subject to incubation following inoculation on blood-, chocolate- and MacConkey agars, for culture of Gram-positive, fastidious and Gram-negative organisms respectively. Tissue samples were subject to anaerobic culture on 10% sheep blood agar. Each patient's organisms cultured were compared to samples from the same patient. Finally, sensitivity profiles of all organisms were obtained to evaluate the most appropriate choice of empiric therapy in this clinical setting. In total, 38 patients were included in this study. Of these, the majority sustained human bite wounds (25 patients), followed by dog bites (11 patients). Only two cases of snake bites were admitted over this time, and no cat or rat bites were recorded. The majority of human bite wounds were sustained on the hands and fingers, with a history of fighting-associated injuries. Dog bites were more common in female patients (male to female ratio of 3:8) and ages ranging from 6 to 76 years (mean 46 years). Human bite wounds were more common in males (male to female ratio of 2:1) with ages ranging from 6 to 58 years (mean of 36 years). As snake bites occurred in only two cases, demographic information in these patient groups was deemed to have limited significance. In 13 of the total 38 cases, only swab samples were submitted for microbiological analysis. In total, 12 cases had investigations involving sampling using tissue specimens. The remainder (13/38) were investigated using both swab and tissue specimens. Among these patients, correlation between swab and tissue samples could be demonstrated in less than 40% of cases. A variety of organisms was isolated from the samples submitted in the investigations of bite cases (Table 1). A variety of organisms was isolated from dog bite wounds. One patient cultured Aeromonas hydrophila from two swabs submitted, the origin of which is unknown. A likely explanation might be that the wound was irrigated with water contaminated with this organism, as its commensal nature in canine mouths has not been described. Although a similar wide range of organisms was found in human bites, the contribution by streptococci was notable. The number of snake bites was too small to draw any conclusions from; however, Salmonella spp was isolated from numerous samples submitted from a single patient. 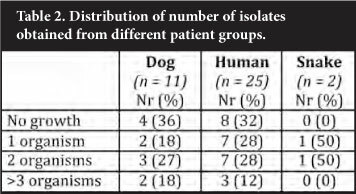 Isolation of a single isolate was an uncommon finding as most patient samples yielded multiple isolates per patient (Table 2). Of note, not a single anaerobic organism was isolated during this study period. Snake and human bite wounds seemed to show the greatest degree of sensitivity. The majority of these cases (12/19 patients with positive cultures) would have responded to the recommended Amox-Clav combination. Should a fluoroquinolone or a cephalosporin have been used, this would have increased coverage minimally, not justifying this practice. The dog bites seemed to show an increase in resistance, with only 20% of culture-positive samples sensitive to the recommended Amox-Clav combination. Use of a second-generation cephalosporin or a fluoro-quinolone would again have only marginally improved coverage to 50% (Table 3). Bite wounds of varying origin, are a clinical entity the clinician is confronted with regularly.6,10 It has been estimated in US-based studies that management of dog bites alone costs as much as $100 million per annum, taking into account initial management and follow-up visits.1 Of note, this study did not consider loss of work-hours or functionality following injury. Timeous and appropriate therapy will improve outcome, and entails local debride-ment and antibiotic therapy.8 For this reason, a thorough knowledge of possible pathogens associated with specific exposures will be of value in deciding upon empiric antimicrobial therapy. Cat bites are more prone to complicate due to the mechanism of injury. Aerobic organisms associated with infection include Pasteurella spp, Streptococci, Staphylococci and Moraxella spp. Anaerobic infection occurs commonly as part of mixed infection, and is associated with Fusobacterium spp, Bacteroides spp and Porphyromonas spp20 (Table 4). The majority of dog bites are purulent with abscess formation occurring in approximately 12% of cases.8 Aerobic organisms typically isolated from these types of wounds are similar to cat bites, but Moraxella infections are rare as opposed to Neisserial infections. Anaerobes are also similar but also include Prevotella spp and Capnocytopaga spp20 (Table 4). Particular care should be taken in the case of Capnocytophaga spp infection in splenectomised patients, as they often complicate with systemic sepsis.21 Therefore, early treatment with Amox-Clav is essential to prevent these systemic complications. 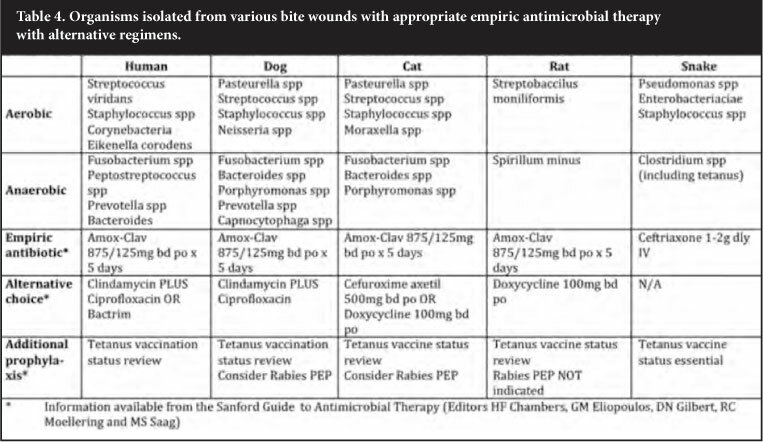 Rat bites are associated with infection by two organisms, Spirillum minus and Streptobacillus moniliformis13 (Table 4). Snake oral flora represents an array of aerobic and anaerobic organisms. Aerobic bacteria include Pseudomonas spp, Staphylococci and a range of Enterobacteriaciae (Escherichia coli, Morganella spp, etc. ).23 Although not commonly isolated, Salmonella spp can also be found as a commensal in serpentine oral cavities.24 Anaerobes include organisms from the Clostridium species23 (Table 4). It is evident that both aerobic and anaerobic micro-organisms are well represented in these wound sites. 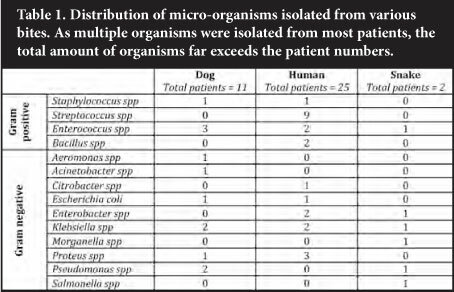 In addition, most studies show multiple organisms isolated from single bite wounds, which reflect the oral flora.20 However, this study showed a notable absence of anaerobic organisms. This is most likely an analytical error, as anaerobes are unequivocally associated with bite wounds. These organisms are fastidious and culture techniques often fail. However, a change of empiric antibiotic choice would require more accurate means of evaluating flora, prior to undertaking this major step. Anaerobes, as the name suggests, are extremely oxygen-sensitive, and demise rapidly upon exposure. For this reason, sampling and transport to the laboratory should maintain the anaerobic conditions as far as possible.27 Some controversy exists on how this is best performed but the practice of submitting tissue and swab samples does seem to show superior yield if combined with expedient process-ing.27 These samples should be placed in a sterile container with a small amount (1-2 ml) of saline to ensure the sample does not dry out. The aim is to maintain an area of anaerobic conditions within the sample to enable culture. 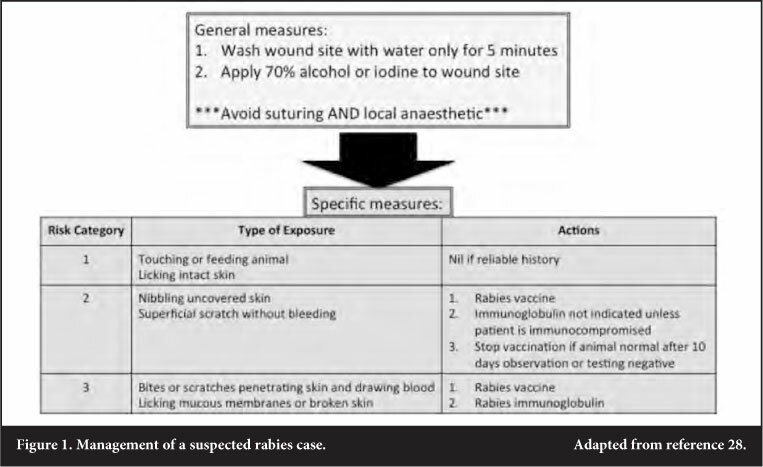 Rabies prophylaxis is indicated in not only bite wounds, but also licking or nibbling of uncovered skin. Species associated with possible transmission include dogs, cats, cattle, mongooses, foxes, jackals and rarely baboons. No cases of transmission has been reported for mice, rats or vervet monkeys.28 Although casualty officers often manage these cases, it is essential to be familiar with current guidelines as set forth by the National Institute of Communicable Diseases (fully reviewed in reference 28) (Figure 1). Empiric antimicrobial therapy is often indicated together with a thorough debridement. Current practice guidelines advise on the use of Amox-Clav as the most appropriate choice in almost all bite wounds (Table 4). In the current study, however, only 20% of dog bites and 63% of human bites would have responded to this choice. It has to be considered that some of the patients may have been exposed to antimicrobials prior to presenting at Steve Biko Academic Hospital. This may have led to the associated sensitivity patterns noted, where an alarming proportion of patients seemed to harbour resistant strains. A thorough clinical and antibiotic history will therefore be of great value in this patient population. In conclusion, bite wounds inflicted by humans and animals may cause a host of local and systemic effects, and aggressive initial therapy is essential to curb complications. In combination with this, microbiological examination of these wounds may assist the clinician in treatment should empiric antimicrobial therapy fail, and it will also assist in the assessment of resistance patterns in order to be able to then evaluate the possible need to change empiric antibiotic choices. This study has been approved by the Research Ethics Committee of the University of Pretoria, protocol number 58/2009. No benefits of any form have been received or will be received from a commercial party related directly or indirectly to the subject of this article. Drs A Visser and HF Visser's work is supported by the Discovery Foundation.